Not a camera that would take a bullet for you. A bullet camera is a small, cylindrical camera designed to look unobtrusive. The name comes from the overall shape which resembles a firearms cartridge. (Shooting sports enthusiasts call the whole thing with shell, cap, powder and lead a “cartridge” even though most people refer to it as a “bullet.”) Early ones had rounded-off backs that added to the overall bullet-like shape. Bullet cameras are also called “lipstick cameras” because they also resemble a tube of lipstick, at least to some people. They are generally considerably larger than a lipstick, and in fact are the size of a large pepperoni in general, although I’ve never heard one referred to as a “pepperoni camera.” You have to wonder why that is. Bullet cameras are perfect for areas where you want to show people that they’re on camera without making a really big show of it. 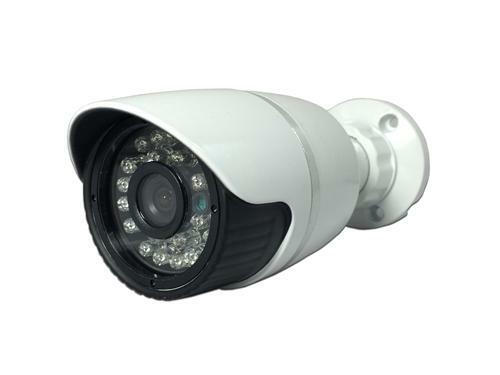 Unlike dome cameras, bullet cameras are generally stationary and cannot be moved or aimed remotely. They sometimes use fixed-focus lenses rather than variable focus or zoom lenses, so that the size and price can be relatively manageable. You may notice that some bullet cameras have a ring of LEDs around them. This is usually to give the camera limited night-vision capability. The LEDs are actually not visible light but infrared, so that the camera can see people without people seeing the camera. However, some bullet cameras use white light LEDs which are meant to improve picture quality while intimidating an intruder. Bullet cameras have become quite popular in low-end surveillance systems because they tend to be very inexpensive and easy to use. They often use the same sensors and electronics as low-end digital cameras and smartphones so they can be very reasonably priced, but higher-end models that feature internal zoom lenses, white light LEDs and waterproof cases can edge up in price to where only professionals are interested in them. Almost all security cameras today record IP video, which is different from the old-style composite video used in security cameras in the last century. Keeping the image digital makes wiring easier because often times a surveillance system can share category wiring with a computer network. If you’re interested in a bullet camera, shop now at SolidSignal.com!